Bicycling is safe. Despite concerns about a lack of facilities or respect from other road users, travelling by bike is still a safe way to travel. The likelihood that you’ll be involved in a serious accident on a bike is exceptionally low, however, most cyclists can share with you a few “close call” stories involving near misses and minor crashes. There is a perception that certain locations or activities carry a lot of risk, but the risk and reality are pretty far away. 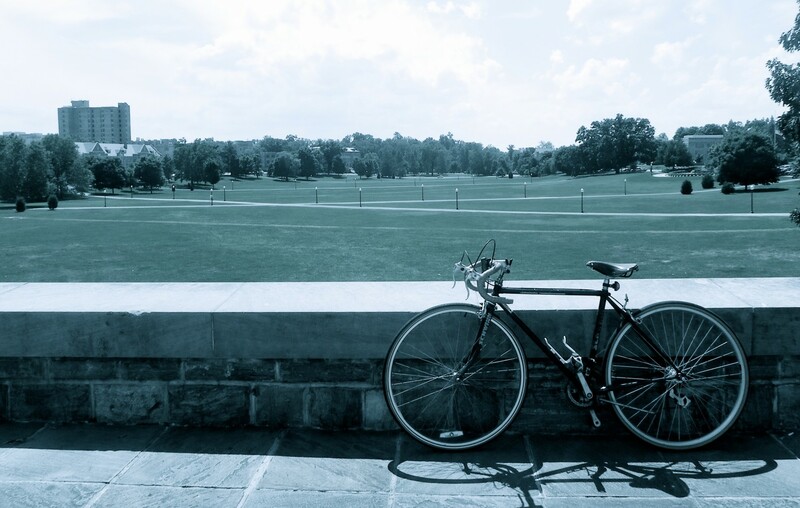 A UNC study on perceived bicycle/pedestrian risks showed that the locations that people felt were the least safe did not correspond to the areas at which crashes and injuries were actually observed. Overall, these attitudes are motivated by an unrealistic level of fear: the perception of risk is much greater than the likelihood of injury. 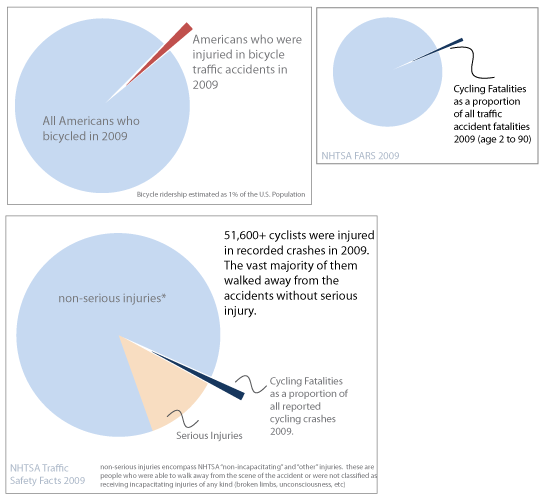 The numbers tell a different story than the media: despite cycling being portrayed as a dangerous activity in many news stories, deadly accidents are extremely rare, much more rare than deadly car accidents, skydiving accidents, and even swimming accidents. National Highway Traffic Safety Administration FARS data shown above. A 3-year Seattle study showed that of all Emergency Room admissions of cyclists injured in crashes, less than 0.5% received fatal injuries, and less than 10% required hospital admission. Crashing is rare, and serious injuries are also very rare. While many cyclists (and potential cyclists) are concerned about the danger of getting hit by cars, only 17% of bicycle crashes involve motor vehicles, and while these are the scariest to think about, almost 1/2 of these accidents are avoidable. According to the League of American Bicyclists, the likelihood of being in any kind of crash decreases as miles increase – in other words the more experience a particular rider has, the less likely that cyclist will be in an accident. This creates the paradox: some people don’t cycle often because they think it’s dangerous – but the more experience you have cycling, the safer you are on the road. So, stop worrying, and keep riding. What activities/behaviors seem to increase bicyclist risk? Poor visibility and distracted drivers/cyclists. More serious car-bicyclist crashes occur in the evening than in the morning commute hours (NHTSA, 2009) This mirrors the national trend for all fatal vehicle accidents. In the evenings, light conditions are low and commuters are tired, distracted by the events of their day, or looking forward to evening activities. Alcohol. In 2009, 24% of cyclists killed had a BAC of .08 g/dL or higher. Alcohol was involved (either for the cyclists or an involved motor vehicle) driver more than 40% of the time. Another study cited intoxication of multiple varieties being a factor, so when your cold medicine implores: “don’t use heavy machinery,” stay off the bike — if you can’t drive safely, you can’t ride safely on roads. Wrong way riding. 5 years of police report and individual-reported crash data from San Francisco and surrounding counties listed bicycles riding the wrong way being responsible for 16% of bicycle traffic crashes. Not obeying traffic law. The League of American Bicyclists cite statistics showing that running stop signs (and red lights), turning from the wrong-lane, and failure to yield are some of the most often cited reasons for a cyclist to hit a car. What rider factors increase risk of injury? injury. They don’t agree on the percentage. Overall, they seem to help in low-speed or solo-crashes – which account for the majority of total bicycle crashes. Competition: competitive race activity appeared to up the risk of injury according to the Seattle study that used hospital records for crash data. Risk of crashing goes up with speed, aggression, and promise of reward for being speedy and aggressive. However — experienced cyclists are less likely to crash overall — so this increased risk really only pertains to competitions and may be more linked to severity of injury than overall crash risk. These generalizations from multiple studies and data sets differ quite a bit from what many cyclists perceive to be their greatest risk factors, in fact, some of the things that people are most concerned about: being hit from behind by a car or crashing in bad weather make up a tiny percentage of total crashes. We know that specific activities and traits are associated with increased injury risk, so we can use this information to take steps to avoid becoming statistics. While you can’t quickly or easily change your age, most of the factors that lead to crashes (or at least, serious injuries in crashes) can be mitigated. Rather than dwelling on fear, we cyclists need to be proactive, educate ourselves, and learn how to avoid/mitigate potentially dangerous situations. Take proper safety precautions and focus on riding well. Become a skilled, educated cyclist. when cyclists are on the sidewalk — car drivers aren’t looking for fast moving traffic on the sidewalks. narrow and riding bicycles on sidewalks is prohibited by town code. destinations than the roads. Cyclists were given permission to ride on campus sidewalks just a few years ago, and to keep that ability cyclists need to show great consideration to pedestrians. When riding on the sidewalk, stop at all intersections to look both ways and cross only when it is safe to proceed. Travel at slow “jogging” speeds and give pedestrians at least 3 feet when you pass. Be Visible. Although most instances of a pedestrian or bicyclist not being seen by a driver occur during poor lighting condition or poor weather conditions, visibility is about more than using lights during bad weather, dusk through dawn, and any time you want extra visibility. Visibility includes lighting, bicycle position on the road, and the “extras” — such a high-vis colors, reflective accents, etc. A white light up front and rear red light are the minimum needed to abide by the law. turning at intersections might not see you. vehicle, and that is often exactly where your bicycle belongs. Wisely positioning yourself in a lane can increase your visibility and virtually eliminate the chance of receiving a door prize or being on the receiving end of a right hook. When approaching intersections in a bike lane always watch the front wheel and turn signals of cars passing on your left, and avoid traveling in vehicle blind spots. When approaching intersections on the roadway, position your bicycle in the center of the lane to prevent vehicles from attempting to pass unsafely in the intersection. This is especially important when bike lanes “disappear” on the opposite side of the intersection. Very few accidents occur due to cyclists being rear ended or occur while being passed by moving vehicles in either the San Francisco or FARS Data. Riding in the appropriate position in the lane to avoid door prizes and to discourage unsafe passing behaviors will keep you safer than sticking to the curb edge. If you are worried about traffic approaching behind you, get a mirror, and you will always see them coming. Choosing Your Lane Position. The rule of thumb for bikes is to ride in the rightmost lane that serves your destination. Turning Left? Use the left turn lane. Bike lane disappears? Use the rightmost traffic lane. Cars parked next to the road? Put at least 3-4 feet between the car door and your body. Assert the amount of space you need to remain safe; don’t hog the road, but remember that everyone is supposed to get as much space as they need to be safe on the roadway – including bikes. The law states that bicycles need to ride as far to the right as “practicable” – which should be interpreted as the distance that is reasonably safe. The Confident Cyclist from Commute Orlando has good advice on lane positioning, turning, and maneuvering as traffic. Choosing the right lane position can communicate your travel intentions to other drivers and prevent them from making dangerous decisions including turning across your lane, ignoring your right of way, or unsafely passing. Always signal your intent before making a move across lanes, and check your mirror (or over your shoulder) for traffic before moving right or left. Use hand signals, head movements, and eye-contact as appropriate to make sure that other drivers understand the moves you intend to make. 2. How to take proper safety precautions and focus on riding well. Most adult cyclists who crash on paved surfaces end up with cuts and bruises on extremities: hands, arms, and legs. In a Seattle study of almost 3400 bicycle crash Emergency Room visits, 34% had injuries to the face and 22.3% had injuries to the head (including superficial). Wearing simple safety gear (gloves, shatterproof sun glasses, helmet) can prevent some of these injuries (or at least reduce the severity) in a crash. Cycling takes just as much attention as driving, and the same factors that cause people to make driving mistakes can make you misjudge the roadways on your bicycle. Medication, alcohol, pre-occupation, and distractions can cause cyclists to be less aware or less able to react to their surroundings. If you aren’t 100% up to riding, you might need to catch the bus instead. Neither the NHTSA FARS or the Bay Citizen data suggest that cyclists are at greater risk in bad weather – however, fewer cyclists are on the roads when the weather is particularly wet or cold, so making this call is difficult. As long as you are properly dressed, a skilled cyclist, and prepared to take a little (or a lot) longer to get to your destination, there’s nothing suggesting you should give up riding just becaues of a little rain, wind, or fog. If the weather is bad enough to prevent people from driving their cars, or even leaving their homes on foot, then it probably isn’t very safe for anyone out on the road. Use good judgment. Because ½ of crashes are solo crashes, you should make sure you have the skills needed to avoid obstructions, make an emergency stop, survive gravel/debris, and ride in non-ideal weather conditions. Consider taking a commuter cycling class, or even a mountain bike workshop, to learn better ways to control your bike, interact with obstacles, and ride in sub-optimal conditions. Crashes do happen. Luckily, they’re pretty rare. Serious injuries occuring during crashes are also pretty rare. On the road, there are several factors that are entirely out of your control. You can’t control the weather, and you can’t control the actions of others. However, you can control your behavior and choices on the road, and that can go far toward keeping you from being included in crash statistics.